Let’s enjoy some semi-good news today. We’ve discussed many times why Obamacare is bad news, whether we’re looking at it from the perspective of the healthcare system, taxpayers, or workers. But it could be worse. Writing in the Washington Post, Robert Samuelson explains that two-dozen states have refused the lure of expanding Medicaid (the means-tested health care program) in exchange for “free” federal money. From 1989 to 2013, the share of states’ general funds devoted to Medicaid has risen from 9 percent to 19 percent, reports the National Association of State Budget Officers. Under present law, the squeeze will worsen. The White House report doesn’t discuss this. …To the White House, the right-wing anti-Obamacare crusade is mean-spirited partisanship at its worst. The 24 non- participating states are sacrificing huge amounts of almost-free money… Under the ACA, the federal government pays all the cost of the Medicaid expansion through 2016 and, after that, the reimbursement rate drops gradually to a still-generous 90 percent in 2020. But that “almost-free money” isn’t free, of course. It’s simply money that the federal government (rather than state governments) is diverting from the productive sector of the economy. So the 24 states that have rejected Medicaid expansion have done a huge favor for America’s taxpayers. To be more specific, Nic Horton of Watchdog.org explains that these states have lowered the burden of federal spending (compared to what it would have been) by almost $90 billion over the next three years. By not expanding Medicaid, 24 states are saving taxpayers $88 billion over the next three years. That is $88 billion that will not be added to the national debt — debt that will not be passed on to future generations of taxpayers. On the other hand, states that have expanded Medicaid through Obamacare are adding roughly $84 billion to the national debt through 2016. Returning to Samuelson’s column, he would like a grand bargain between states and the federal government, with Washington agreeing to pay for all of Medicaid (currently, states pay a portion of the bill) in exchange for states taking over all spending for things such as roads and education. We could minimize this process for states and localities by transferring all Medicaid costs to Washington (or at least the costs of the elderly and disabled). To pay for it, Washington would reduce transportation and education grants to states. Let Washington mediate among generations. Let states and localities concentrate on their traditional roles of education, public safety and roads. Spare them the swamp of escalating health costs. This is the bargain we need — and probably won’t get. I like half of that deal. I want to transfer education, law enforcement, and roads back to the state level (or even the local level). But I don’t want Washington taking full responsibility for Medicaid. Instead, that program also should be sent down to the states as well. This video explains why that reform is so desirable. P.S. 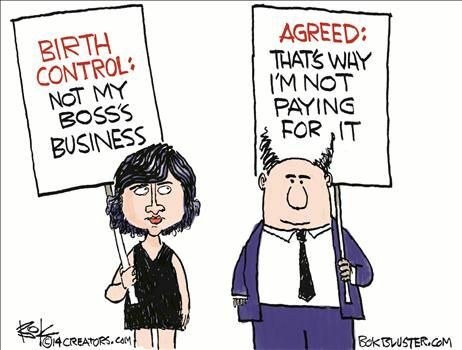 Since we’re on the topic of Obamacare, this Chip Bok cartoon perfectly captures the essence of the Hobby Lobby decision. The left wants the mandate that contraception and abortifacients be part of health insurance packages. Rather than exacerbate the damage of using insurance to cover routine costs, wouldn’t it make more sense to have employers simply give their workers more cash compensation and then allow the workers to use their money as they see fit? That way there’s no role for those evil, patriarchal, oppressive, and misogynistic bosses! I realize this might upset Sandra Fluke, but at least she has the comfort of knowing that her narcissistic statism generated some good jokes (here, here, and here). Agreed, but we have federal laws that dictate care such as show up at an emergency room without insurance and they can’t turn you away. Then we have all the medicare regs. What do you want to do with those? Obamacare is bad news primarily because such a socialist program was passed by the House and the Senate and signed by the President. What the hell were they thinking??! !